How do you prove membranes are fluid? The first group of studies in this presentation will focus on membrane fluidity. This is made possible by the rotation of lipids and proteins in the bilayer. Membrane proteins (like lipids) rotate about an axis perpendicular to the plane of the bilayer. However, they may also move laterally. The following experiments show that not only do membrane proteins move, they can rearrange. The first experiment was done on fused cells. One group of cells came from a mouse line and the other from a human cell line. The investigators obtained antibodies to proteins in the membrane and conjugated these antibodies to fluorescein (green) or rhodamine (red) fluorescent compounds. The cells were then fused, forming a "heterocaryon" (note the two nuclei). 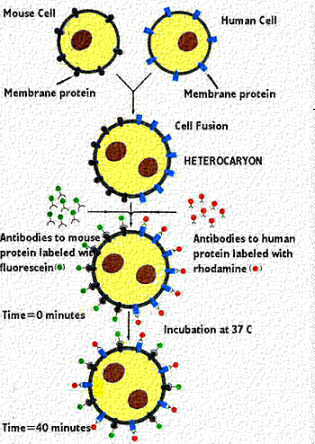 Then, the two sets of antibodies were applied. Initially the cells were labeled half red and half green. However, after 40 min at 37 C, the labels mixed and the cells showed mixing of the two dyes. Often this mixing turns out to be white fluorescence. This figure was taken from Alberts et al. Molecular Biology of the Cell, Third Edition, Garland Publishing, N.Y., 1994, Figure 10-34. Note: if incubation was at 4 C, what do you think might happen? 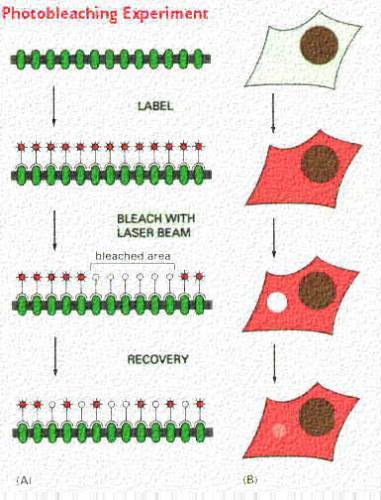 In the next experiment, the label on the membrane is "bleached" in one area with a laser beam. The figures to the right show the results. Bleaching removes the label on the protein and results in a clear area (area of no label) in a completely labeled cell (see following figure). Then, one can watch the recovery in the bleached area as the proteins + label diffuse into the irradiated patch. 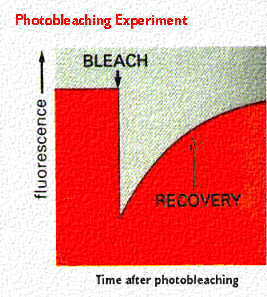 The figures show the bleached area as white. In the figure below, the recovered patch is a lighter red.